"Keep Your Heart Smiling A natural Way"
Hearto is a unique herbal remedy for heart ailments. 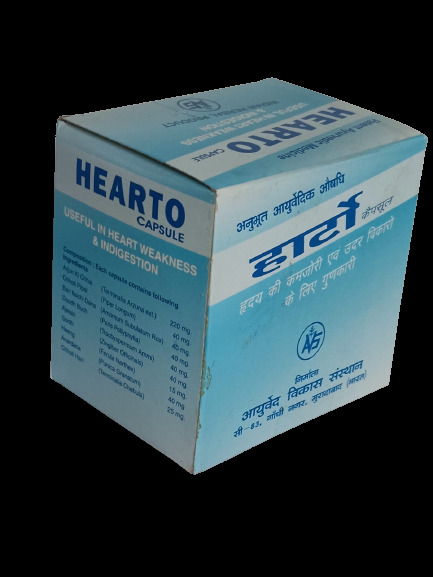 Being herbal, provide a distinct advantage of least side effects and ability to benefit in almost all type of cardio-vascular problems. It normalizes the blood pressure, helps in prevention of heart attacks, regularizes heart beats and reduces blood cholesterol. Apart from its beneficial effects over heart, it also serves to relieve indigestion and gas trouble. The principal ingredient in hearto is terminalia arjuna (locally known as arjun ki chhal). Research suggests that Terminalia is useful in alleviating the pain of angina pectoris and in treating heart failure and coronary artery disease. Terminalia may also be useful in treating hypercholesterolemia. The cardioprotective effects of terminalia are thought to be caused by the antioxidant nature of several of the constituent flavonoids and oligomeric proanthocyanidins, while positive inotropic effects may be caused by the saponin glycosides. In addition to its cardiac effects, Terminalia may also be protective against gastric ulcers, such as those caused by NSAIDs . 1 Arjun Ki Chhal Terminalia Arzuna 220 mg.
2 Chhoti Pipal Piper Longum 40 mg.
3 Bari Ilaichi Amomum Subulatum Roxb 40 mg.
4 Doodh Bach Paris Pollyphylla 40 mg.
5 Ajwain Tracbyspermum Ammi 40 mg.
6 Sonth Zingiber Officinals 40 mg.
7 Heeng Ferula Narthex 15 mg.
8 Anardana Punica Granatum 40 mg.
9 Chhoti Harr Terminalia Chebula 25 mg.
2 capsules thrice a day with water, half hour before meals.